HeadsUp Relief Hangover Prevention – Win! So you’re likely to have a few more than usual…. And, wake up feeling it, because, none of us are 19 anymore. Here’s something else to try – HeadUp Relief. Four (rather large – poor Bruce had a little trouble swallowing them) pills of vitamins, taken before bed, to help your body deal with the alcoholic onslaught. I’d recommend more water with them than I had, but wanna try them yourself? 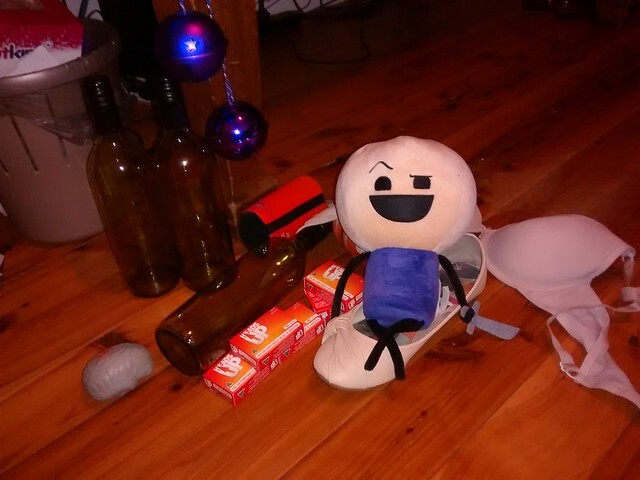 Haha oh man I have one of those cyanide and happiness plushies too! Love him. I got my ex a “naked” one a few years back. But definitely drinking lots of fluids before bed helps. And Yakult too to help replenish all the gut bacteria you just destroyed. Drinking water BEFORE going to bed, then drinking plenty of fresh fruit juice the next day. Sorry Amber, I didn’t even read your answer before posting! Our hangover cure must work, because we both thought of it! Water & fruit! I drink water, eat lots of fresh fruit and ice and I never have a problem! Big breakfast, if you can stomach it, plus lots of water, followed by coffee. But first, POWERAID!! !